of the visual storyboards inside. 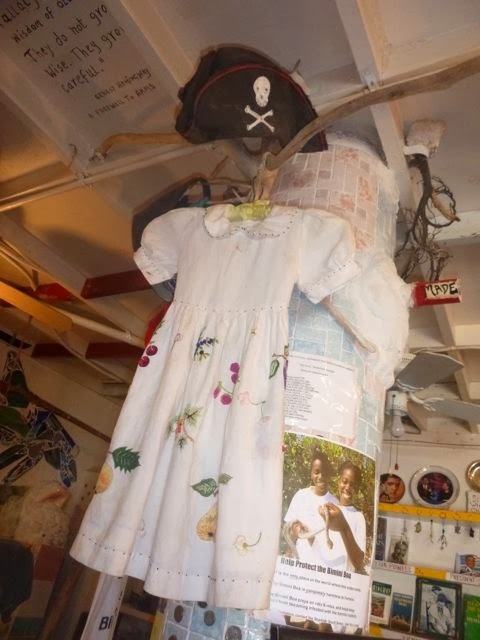 In 1600 miles of sailing from St. Lucia to Fort Lauderdale Florida, there were only two places that tempted me for an overnight stay off the boat. 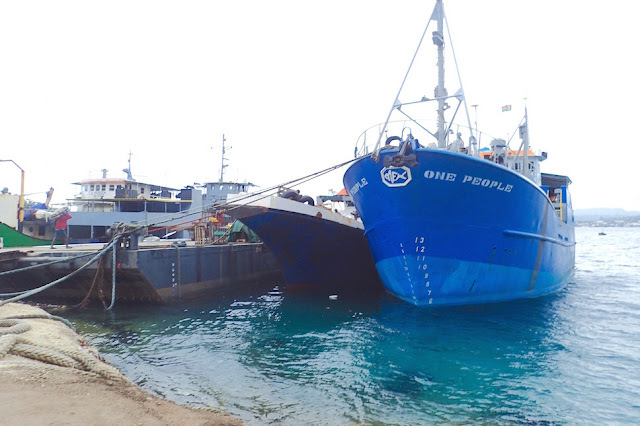 One was an ecolodge on Saba. The other? 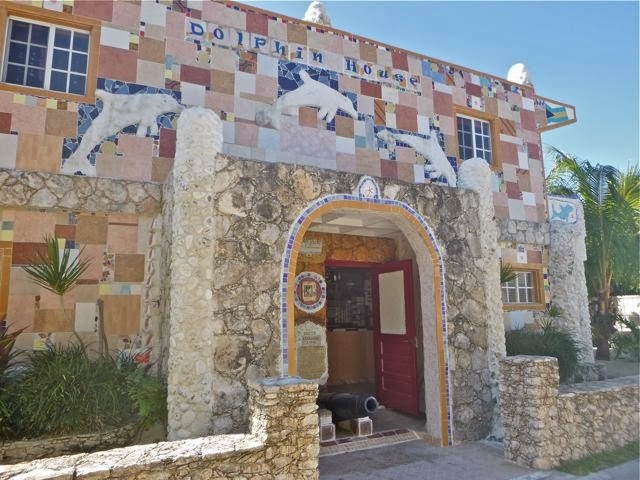 Bimini's Dolphin House. 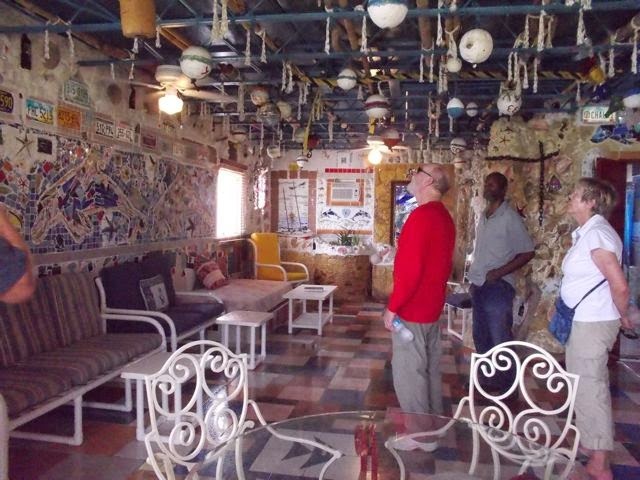 In fact, we chose to return to the Bahamas via Bimini to revisit Dolphin House and chat again with its extraordinary creator, Ashley Saunders. We cut our tour short the prior year when we got struck by a deluge of rain so bad, we saw a restaurant crew jack-hammering holes in the sidewalk in from of their restaurant for drainage. Turns out, we missed the boat -- or -- in this case -- a night off the boat. Dolphin House no longer hosts guests overnight. Touring the museum and gift shop is still free (though donations are appreciated). "I had to decide if I was in the guest cottage business or if I wanted to share Dolphin House with visitors. Overnight guests complained they felt 'invaded' when visitors came to see Dolphin House. I decided it was more important to continue to share Dolphin House." With clear blue skies and no impending storm, I got to peruse the museum that wasn't part of the house. It's a shrine to Hemmingway, and other various and sundry bits of history. Out of deference to Ashley's time, this time I skipped revisiting inside Dolphin House (click here for tons of photos from last year's Dolphin House visit and if you go to Bimini ... Do. Not. Miss. It.). But I still wanted to see how his rooftop map evolved. It was just in the idea phase last May, a map. Rooftop map in process (or... done?) at Dolphin House. Bimini. Got Any Spare Blue Tiles? "I'm running out of blue tile," Ashley explained, a bit remorsefully. "It's hard when what I'm making is from found materials." 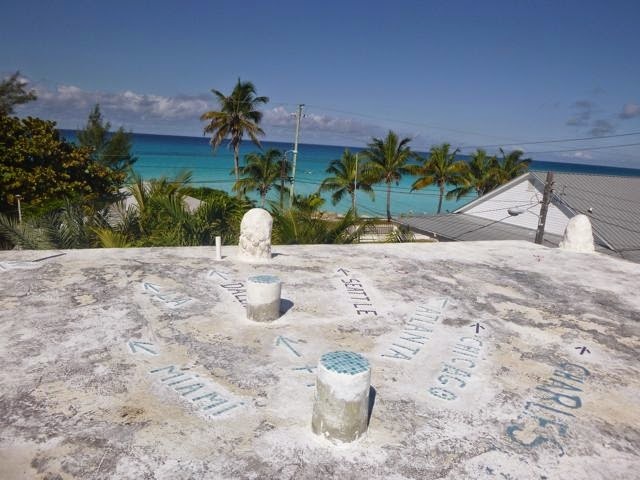 Seems for now if not beyond, the rooftop is a spare, simply geographically relevant placement of key places in the world. ThreeSheetsNW, you'll be happy to see Seattle made the short list - and that was before the Seahawks swept the Superbowl. If you can spare some blue tile bits, Ashley could put them to good use! colorful collages, while Phil and Gunnel are agog, taking it in. 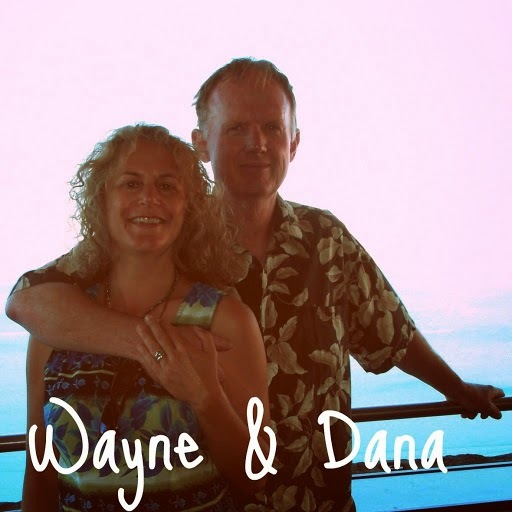 This is a retrospective from our last cruising season, when we entered the Bahamas via a 125 nm overnight sail from Marathon FL to Bimini, BAHAMAS. We stayed at Blue Water Marina (N25.43.456 W79.17.887). We are currently working over hurricane season in Jacksonville FL; this time with our boat “on the hard” in Green Cove Springs, until just before we leave in November, bound for the South Pacific via the Panama Canal. There’s still lots of retrospectives coming up, plus how we’ll plan for long ocean passages.